Amsterdam, November 13th 2017 - Heineken owned tequila-flavoured beer, Desperados, takes to the skies with "SkyFest" its latest global campaign and outrageously ambitious wild experiment in music, created by Amsterdam based Ideas Company, WE ARE Pi. 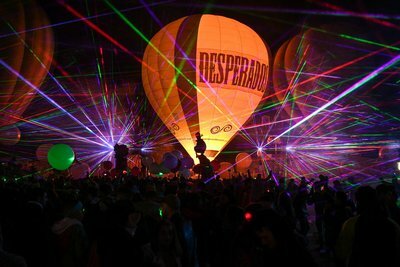 Dubbed an "electronic light orchestra", Desperados SkyFest is a fully fledged Spanish mountain-top music festival taking 'wild experiments in music' to the next level by using seven hot air balloons as DJ booth, dance floor and synchronised light show. 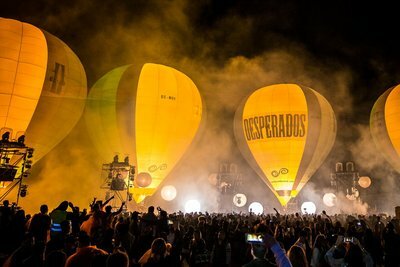 Desperados shook up the festival scene with ‘SkyFest,’ a multi-sensory event in Spain that blended world-class music with an immersive experience, sending DJs and festival goers to the sky in the brand’s latest wild experiment in music. 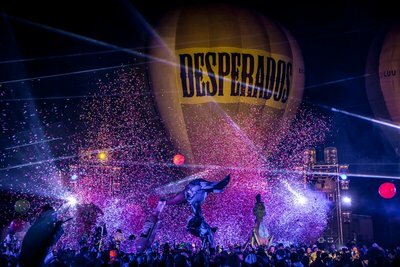 To bring the idea to life, Desperados global creative agency WE ARE Pi brought on festival organisers, elrow to host the event, Resident Advisor for ticket sales, and a host of superstar DJs to entertain fans from across the globe. The resulting content was created with VMA award winning director Ryan Staake from Pomp and Clout productions. ‘SkyFest’ came to life for over 1,500 of participants from all over the world. Each balloon was an instrument, each musician a pilot and together they performed a choreographed light show to the SkyFest Theme composed by Eats Everything. The also event featured well-known DJs, Jackmaster, Honey Dijon and local fan favourite, Paco Osuna. Jackmaster, headliner DJ, said, “Playing with a hot air balloon electronic light orchestra was a once in a lifetime experience. Looking down over the crowd was crazy. A real pinch yourself moment. It was surreal to perform at such a unique festival with so many people from all over the world. It was an incredible music experience and one of the reasons I love doing what I do"
Alex Bennett-Grant, Head of Strategy, WE ARE Pi, said "Desperados asked us to making them the most iconic millennial beer brand, by positioning them as the wildly experimental party starting beer. So, we hosted a full-on music festival and invited the world to experience an insanely iconic musical experiment with 7 hot air balloons. Is it impactful? Hell yeah! Check out Instagram #skyfest and enjoy the outrageous results." SkyFest is the next act of ‘Release your Inner Tequila’, Desperados’ Global Marketing campaign which invests in a series of unique experiences to foster wild experimentation in music. Previous activations in this series include; Train Trax where Desperados worked with the renowned electronic music group Mount Kimbie, to turn an ordinary train in Warsaw into a music instrument for fans from across the globe; Bass Drop, a party onboard a plane at zero gravity 30,000ft above the Nevada desert and House Party Unplugged, which saw an ordinary house transformed into a backing track. WE ARE Pi is an Amsterdam-based international Ideas Company, founded in 2011. Guided by the promise to ‘Never Settle’ Alex Bennett-Grant, Rick Chant, Barney Hobson, and Patrick Garvey lead WE ARE Pi to provide best-in-class integrated strategies and creative platforms for clients including Heineken, LEGO, TED Conferences, Wrangler, Nikon, Oath, Philips TV, InsingerGilissen and Ace & Tate.